BASKETBALL SPOTLIGHT NEWS: Spotlight Alum Clarke Heads To Sacred Heart! 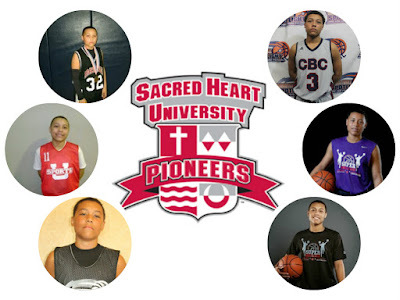 Basketball Spotlight Alum Aaron Clarke has committed to Sacred Heart University. Clarke starred on the Spotlight circuit with several teams including Team Battle, Team IZOD, CBC and finally Team Scan. He was known as one of the best shooters to come through Basketball Spotlight. He capped his middle school career off by winning the MVP of the J.E.M. All Star Classic. Clarke went to have huge success in high school at Pope John even winning Conference Player Of The Year this past season. Basketball Spotlight would like to congratulate Clarke on his commitment and wish him the best the rest of the way. Just remember this is just the beginning and keep working hard. Stay tuned as we bring you more top players and their college commitments.